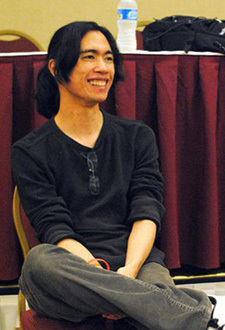 Voice Over Artist Guest for HAMA5: Micah Solusod! Almost five years ago, we started an anime con in Huntsville, AL and one of our guests was a young up and coming superstar named Micah Solusod. He was at the time known for being the the voice of Soul Evans from Soul Eater. But now, he’s that and a whole many more! But he’s still coming to Hamacon. Micah has also shown up in other FUNimation titles as Toma Kamijo in A Certain Magical Index, Ao Fukai in Eureka Seven AO, Gai Tsutsugami in Guilty Crown, Midnight in Fairy Tail, older Ame in Wolf Children, Coby in One Piece, Mizuki in Kamisama Kiss, Tsutomu Senkawa in Birdy the Mighty: Decode, Yukitaka Tsuitsui in Level E, Jonah Mar in Jormungand, and most recently, Bea in Space Dandy. It’s likely he’s done more but who’s counting? And did we mention he’s an amazing artist? Did we also mention he’s the lead illustrator for the fantasy webcomic Ties That Bind (http://www.micahsolusod.com/painapple/)? Well then we’re glad we cleared things up for you! What,our guests aren’t enough? Worry not! We have a great venue at the Von Braun Center South Hall, that will be filled with wondrous dealers and artists, along with an avalanche of great panels and events, with room to spare. What, you also need a hotel room? We can help you with that as well: http://hama-con.com/hotel/ As always, we are very helpful. We cannot wait to see both Micah Solusod, and all of YOU, at Hamacon 5! Let’s clear the next stage! ← Voice Over Artist Guest for HAMA5: Jad Saxton!